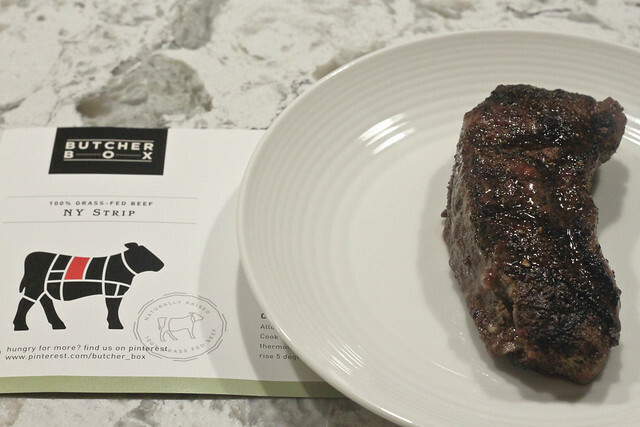 Disclosure: Butcher Box provided me with products at no cost to me, in exchange for a fair and honest review. All opinions are 100% my own. Steak night. There’s just something special about steak nights in our house. A few years ago, we went to our first steakhouse dinner, and we quickly realized what we were missing when it came to a perfectly cooked steak. Super thick cuts of meat, seared perfectly, resulting in a melt in your mouth-type of dinner. It was just outstanding, and because of that experience, our steak purchases were forever changed. When we first got married, we used to buy whatever steaks were on sale at the grocery store. It didn’t matter the cut…as long as it was beef, we were game for it. I remember looking at the price of ribeye and filet, and thinking really? Is it worth it? It’s all cow. Ignorant ignorant ignorant. Y’all…yes, it’s worth it! Now that my husband has a nice grill, I especially love steak nights. He can somehow grill a killer crust on a steak, and I’m a medium-rare/medium steak gal myself. He gets it perfectly every.single.time. Steakhouse at home? Yes, indeed! I was so impressed with the care that they took in the shipment. The beef was still frozen solid (thanks to dry ice), and everything was vacuum packaged for us to throw into the freezer. 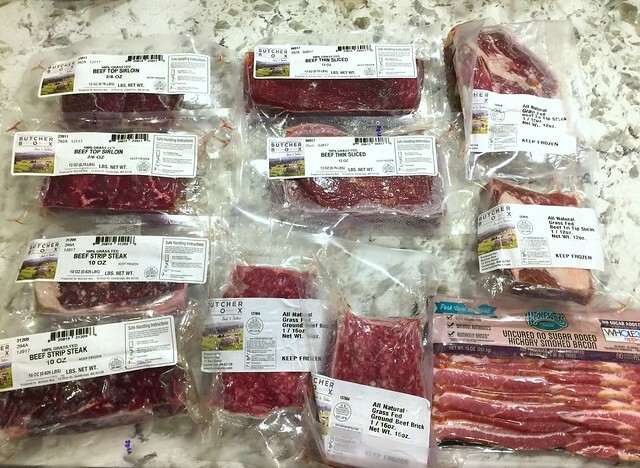 Our package contained grass-fed beef strip steaks, top sirloins, tri-tip steaks, thinly sliced beef, ground beef and a package of bacon. That’s enough for several meals in our 2-person household. Our package also included recipe cards to use with their products! It’s just a well done (ha, I crack myself up!) package. So far, all of the meat we have tried has been fantastic. I find that grass-fed beef is more flavorful, and the quality of the meat is great! All of the steaks are good, thick cuts of steak, too. Perfect for grilling! I love what Butcher Box offers. First of all, you don’t have to source out your meat. They deliver 100% grass-fed beef, organic chicken, and all-natural pork straight to your door. I also appreciate that it’s pre-portioned out for easy freezing. Also, shipping is included in the cost, so you know exactly what you’re paying when you choose a subscription box. Also, if you’re looking for a last-minute gift idea, Butcher Box offers gift subscriptions. I think that’s a really neat, out-of-the-box idea. I know of a few people in my life who would love something like this (think of the person who has it all…what a unique gift idea, right? ).